Nepali actress, Usha Poudel, is going to debut in a Bollywood movie ‘Sun Ladki’. The actress who started as a television actress in Nepal and was featured in Nepali movies like ‘Muna Madan’ was struggling in Mumbai for last few years. The pre-production of ‘Sun Ladki’ has completed and is going to floor soon. In the movie, Usha’s role will not be the leading actress but next to the leading one. If the movie becomes successful, there is a high chance that Usha might establish herself as a Bollywood star. The rumor about Usha doing the Bollywood the movie started last year. A news about a Nepali actor, Shri Krishna Shrestha, starting a business named “Kollywood Planet” left me thinking – is the Nepali movie industry Kollywood? Although, Shri Krishna Shrestha’s business doesn’t seem much related to the Nepali movie industry, I have a feeling, he does want to represent the Nepali film industry. The name, Kollywood, seems to be inspired by the combination of Kathmandu and Hollywood. But, when I checked the name in Google, there was no reference of Kollywood being related to Nepali (or Kathmandu) film industry, at least, not on the first page. In the modern time, Hollywood has become an iconic name to represent the US movie industry. The success of Hollywood movies has inspired other film industries to nickname themselves with Hollywood-inspired names. Hollywood is a district in Los Angeles, California, United States (yes, it’s not a movie industry in itself, as believed popularly). The place situated west-northwest of downtown Los Angeles, got it’s cultural identity as the center of movie studios and movie stars when movie making activities increased in the early 20th century. On the evening of Saturday, December 10, 2011, various artists including various singers and comedy artists of Bollywood presented various programs. The main attraction of the program was the singer Mamata Sharma and comedy artist Raju Srivastav. Is ‘K Yo Maya Ho’ based on an original story? It is a second venture of Sudarshan Thapa and also he had commited that this movie is not a copied movie like his previous one Mero Euta Saathi Chha. He had confirmed that this movie contains totally fresh story of four youngsters. Music of the movie was expected to be good and finally it has got very good response too as Sudarshan and Sugam’s first movie Mero Euta Saathi Chha. Technology in Movies – Is that the reason Nepali movies are bad? It was an incident when I went to watch a movie in Kumari Cinema. During the interval, when I was having coffee with one of my friends we saw a group of guys aged 18-22. They were were there to watch a Hindi movie. One of the guys showed the poster of a recently released Nepali movie ‘Mann Manai Man Paraye’ and said, Why all Nepali movies have got same type of posters and story? Always action and same actors? Another replied, "Our country is poor, so Nepali film industry lacks the technology Hollywood and Bollywood is blessed with. Nepali film makers have to work with limited technology. Or else our movies will also be better like Hindi and English ones." I felt good to hear the positive views of the youngsters about Nepali films. Movie Reviews – How do Nepali reviewers review movies? Note: This article follows the previous article – Movie review – How is it done? in which Raunak has talked about how a good review is written. In this article, Raunak is analyzing some Nepali movie reviews. At the time when Hindi movie Ravaan featuring Avisekh Bacchan and Aiswarya Rai was released (June 18, 2010), Nepali daily Kantipur published a review of the movie after a few days of the release. The review mentioned that the movie also featured Manisha Koirala and Govinda. The article appreciated their role even if they appeared briefly in the movie. I had watched the movie on June 19 (before the review was published) so I had to ask a friend for the DVD of the movie to confirm the error in the film review. There was no mention of Manisha in casting and she never appeared in the movie. Editor’s Note: This is the final part of “Who loves Nepali Movies?” article series. This however is not a complete picture of Nepali theaters – there are a lot more to be written about. If we choose to publish more articles on the related theme, we will update this article in the future and, add the links to the new articles. Who loves Nepali movies? we do! And, there are a lot of our friends, our visitors to this blog – they all love Nepali movies very much. Based on the love of the viewers, a lot of Nepali movies are being produced/released every month. At the same time, everybody agrees that the quality of the movie can’t be compared with Indian, Bollywood movies or English, Hollywood movies. Nepali movies have a limited market and our producers have limited resources in terms of producing movies. Not having a single shooting studio in Nepal explains how poor we are in terms of the infrastructure and resources to produce ‘good movies’. But, everybody admits: with such a limited resources we have witnessed some ‘very good’ movies and, that is something to be proud of. We started this series to analyze if the theaters are treating Nepali movies fairly. Big Cinema, a theater operating on Indian investment announced not to screen Nepali movies accusing – Nepali movies do not have any quality. If that was the case why did they start the business in an immature market? Said that, we are not against some preferential business. They are free to compete in the free market. At the same time, business logic says that they also need to satisfy their client – Nepali people. Big Cinema has no emotional attachment to Nepali movies. Theaters owned by our own Nepali citizens have emotional attachment with their own creations (most of them are producers too). But, it is a sad truth that they also prefer foreign movies to Nepali movies. Big Cinema – You should learn to love Nepali movies if you want to do business in Nepal. Guna Cinema – Heights of discrimination between Hindi movie and Nepali movie viewers. Gopi Krishna Movies – Nepali viewers treated with negligence – discouraging the high class Nepali to watch Nepali moives. QFX Central – Nepali version of Big Cinema. It should learn to love Nepali movies. Will HDNepal.com face the Kasaju brother's fate? Arrest of Kasaju brothers on the charges of distributing movies illegally in Nepal has raised some issues previously considered off-limits in Nepalese contest. It is believed that Nepali people can’t afford to purchase Hollywood movies legally and the only way they can watch is by illegal means. After the arrest of the owners of cybersansar.com and givemehd.com, the sites are now offline and people operating similar businesses are reconsidering their business practices. While searching, I found a similar site, offering similar movies and designed by the same company owned by Kasaju brothers. 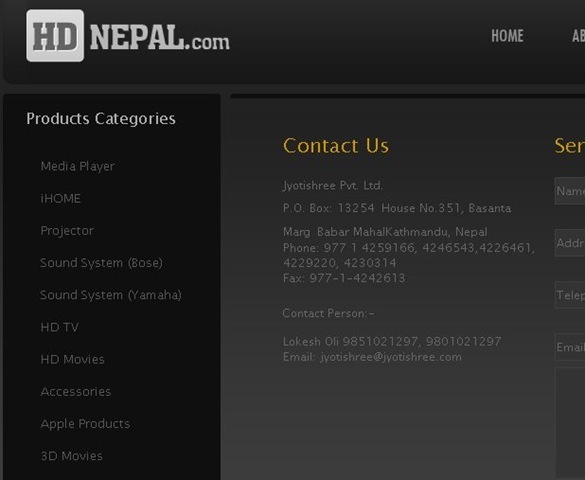 The website hdnepal.com, is still online and it also has similar information and services to that of givemehd.com. According to the site, the service is provided by Lokesh Oli and the physical office is located in Babar Mahal, kathmandu.